I love murder mysteries, both participating in and planning them. 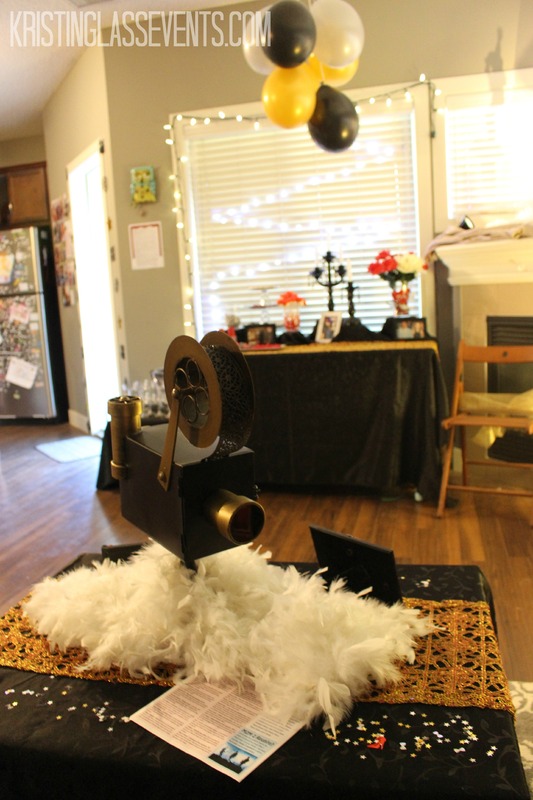 Check out my Hollywood themed party decor for a recent murder mystery party! Read on for some fun and affordable ideas to really nail this event theme. Our budget for this party was limited, so we held it at our apartment and opted to incorporate the design into our own decor instead of giving our apartment a total facelift. This worked well because the concept of the party was that it was a Post-Oscar Bash at someone’s home. Check out Night of Mystery for more details on this particular story. For this party, I went for the pretty stereotypical colour scheme of red, black, white, gold, and silver. These colours work so well for a Hollywood party because it is easy to put any selection of them together and make them look really glam and sleek. I borrowed some black linens and used those on the tables, as well as to cover our green couch (I was worried it might look like Christmas in there otherwise!). I also had a gold tablecloth that I used for our fireplace display – I’ll get to that later – and I was able to find a couple amazing red and gold table runners that really brought everything up a notch. All of these things created a great base for the rest of the decor I had planned. It wasn’t very difficult. I used male Barbie-type dolls (I don’t think any of these are actually a Ken… I know that one was Justin Bieber and the other two are some unnamed and unidentifiable pop stars) that I purchased at a thrift store for a couple dollars each. I then gave them a few coats of gold spray paint and glued them to hockey pucks for bases. I also glued on gold stickers to name each of the awards – we handed them out at the end of the night. To create a fitting display for my statues, I put each on a stand or riser and laid out a gold tablecloth, then I hung a ring from the ceiling and glued wide ribbon on to hang down as streamers. I placed a couple feather boas around the bases of the risers to create a cloud-like quality, and I propped up a couple spot lights on the feature. I loved the way it turned out! One of our friends had been assigned to be the character that was hosting the party. This character had famous parents and was a bit insecure, so my co-host and I figured it would make sense if this famous character’s home was absolutely covered in photos of himself with celebrities. We collected photos of celebrities with other people, and my co-host (often poorly) photoshopped our friend’s head onto the other people. We then got those printed, put them in frames, and even glued some red and white gems to some of the frames. These were put throughout the room. I scored a model old-fashioned camera at an event company’s garage sale about a month prior to the party, and I created a coffee table display around it. This was one of my favourite parts of the room. Using construction paper and tape, my co-host and I created a Hollywood hills scene in our window. This was very cheap but looked way better than I had imagined it would. We actually forgot to lift the blinds at the beginning of the evening, but this lead to a photo shoot with everyone in front of the window at the end of the evening. You can see the window display in the background here. I hung gold, silver, and black balloons from the ceiling above the couch and above the snack table. I feel that this added a nice touch of colour up high. You can see these in some of the photos above. I love to do a candy bar at events – you can add some great colour this way, plus your guests get snacks! For this one, I used clear glassware and got only red, white, black, gold, and silver candy. For more information on the themed refreshments provided at this party, head on over to An Oscar-Worthy Spread – A Hollywood Party Menu. I used different sets of white lights around the room. It seemed fitting for the theme and certainly added to the mood of the event. I created these out of pie tins, empty wrapping paper rolls, christmas balls, mardi gras beads, and a hot glue gun. I did have to mess around with the bases and add some weights to make sure they would stand, but I was really happy with how they turned out. This red carpet is just a couple dollar store table cloths taped down. It held up pretty well for our party of 21 people! I hope you found these Hollywood themed party decor ideas helpful! What did you do to make your event extra special? Let me know in the comments!